Photo by Blue Grass Stockyards. Photo by Kentucky Horse Park. Photo by Buffalo Trace Distillery. Home of the North American International Livestock Exposition. 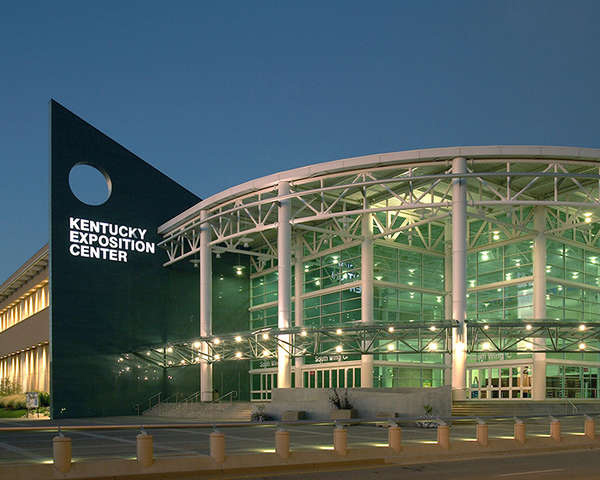 Photo by Kentucky Exposition Center. Register upon arrival and enjoy a meet and greet with your colleagues, representing Galloway and Belted Galloway breeders worldwide. After a morning of traditional reports, meetings and lunch you’ll tour Louisville’s Museum Row with options to visit the Frazier History Museum, Muhammad Ali Center or Louisville Slugger Baseball Museum; all located in the Bourbon District of downtown Louisville. For history buffs, these museums bring to life the history of Kentucky. Tour the Bluegrass Stockyards Regional Marketplace in Lexington, Kentucky, the largest livestock auction market in the Eastern United States. Also enjoy a presentation at the Kentucky Cattlemen’s YARDS Education Center, with insight of the beef industry for producers and consumers. After lunch you’ll tour the spectacular 2,000-acre Kentucky Horse Park, home to the 2010 FEI World Equestrian Games. The impeccable facility showcases the history of man’s relationship with the horse. The day concludes with dinner at the Claudia Sanders Dinner House, once the base of operations for world famous, Colonel Sanders and the Kentucky Fried Chicken franchise. Spend the day visiting Galloway and Belted Galloway farms. Speakers from the Natural Resources Conservation Services (NRCS) and the Kentucky Beef Council will provide educational information at each stop. The day concludes with a private tour, tasting and dinner at the Buffalo Trace Distillery, home of the famous (and expensive) Pappy Van Winkle bourbon. Over 200 years of fine bourbon craftsmanship make Buffalo Trace the world’s most decorated distillery. Enjoy the North American International Livestock Exposition while watching the Belted Galloway junior show. The two-week event features all breeds of livestock, with exhibitors from 48 US states. The evening will be capped off by the US Belted Galloway Society annual meeting, banquet and cattle sale. Visit the 150-year-old Woodland Farm in Goshen, Kentucky, a 1,000-acre American Bison farm. Later, lunch will be served on Millionaires Row at Churchill Downs, home of the Kentucky Derby, an afternoon of racing along with a tour of the famous grounds and museum. Spend the day visiting the University of Kentucky’s 1,000-acre Eden Shale Farm. The research farm, managed by the Kentucky Beef Network, is open for tours to showcase a wide variety of industry interests including water management, fence line feeding systems, forage testing, weed management and genetics. Lunch will be served nearby at the beautiful Elk Creek Vineyards. As an added bonus for those wanting to extend their farm tour experience, up to 10 Galloway and Belted Galloway farms located less than a 4 hour drive from Louisville, Kentucky will be available on an individual basis.